A naan-seller wearing the now-required military gear to ply her wares. The people’s war on terror in China’s northwest region of Xinjiang has been gathering momentum incrementally since Chen Quanguo took over as Communist Party secretary of the troubled area two years ago. Things moved up a notch this summer in the southernmost prefecture of Hotan. In addition to every butcher, baker, and candlestick maker in the bazaar, who now have to dress like soldiers, all middle and high school pupils were suddenly ordered to join the swelling ranks of other combat-ready citizens. With the beginning of a new term, it was goodbye to the multicolored headscarves and tartan skirts for girls and tracksuits for boys, and hello to army camouflage for everyone. From this term onward, skirts have joined the list of banned clothing for schoolgirls. Not content to leave warfare to the professionals alone, Chen, fresh from Tibet where he made a serious attempt to knock dissenters into shape, has increasingly been militarizing every citizen in Xinjiang, preparing them to fight a foe which has yet to present itself, but which he maintains will appear at any moment. Schoolchildren in the south of Xinjiang are just the latest recruits of this policy, following closely on the heels of orders from the top putting every store holder or shopkeeper on high alert. Everyone from walnut sellers and milliners in the market to restaurateurs and bric-a-brac peddlers now has to wear tin helmets, bulletproof vests, and army fatigues during their working day on pain of serious reprisals should they fail to comply. That is in addition to the unwieldy ax handles, people restrainers, and riot shields that must be their constant companion in case of emergencies. Training in tactics for the “enemy invasion” is carried out several times a day. Work comes to an abrupt halt as every unit of 10 shopkeepers is mobilized by several short whistle bursts from their “team leader” and urged to run to a rallying point where they gather in formation behind shields, with clubs at the ready. This is the human face of an invisible war, one that has yet to actually materialize in the form of an enemy on the ground, but warnings of which are designed to keep everyone on their fighting-fit toes. Evidence that several thousand Uyghurs have been to Syria to fight alongside Islamic State — and videos produced from time to time by their radical wing proclaiming holy war against China — has been enough to justify a province-wide roll out of security of Orwellian proportions over all of Xinjiang. A vocal independence movement propelled by the Uyghur diaspora and several violent incidents instigated by Uyghurs over the years have always necessitated a significant security apparatus throughout the region. This was beefed up four years ago after a number of four-wheel drive vehicles mowed down early morning market goers in downtown Urumqi, the capital of Xinjiang. But nothing could have prepared Uyghurs for the onslaught on their privacy, freedom, and autonomy once Chen Quanguo, fresh from commanding the “battlefields” of Tibet, took the helm in August 2016. Shortly after Chen assumed power, the entire People’s Square of Hotan saw an impressive show of military might, as it was filled with thousands of soldiers marching, yelling, and chanting allegiance to the Chinese Community Party and the state. For a year after that, every morning at 10:30, traffic was suspended and the “invading forces” would parade for an hour through the city’s main thoroughfares. Sirens blaring and headed by a cordon of 50 motorcycles, over a thousand soldiers followed on foot in platoons, stopping every now and again to shout slogans. Armored vehicles topped with enormous guns, personnel carriers, and trucks filled to the gunnels with soldiers followed up the rear slowly and menacingly as ordinary people anxious to go about their everyday tasks looked on, in silence, powerless and unprotesting. A year on, the daily parades have stopped, but the invading army has melted insidiously into a new world of ramped up monitoring and surveillance. In this new reality, people are compelled to spy on each other; every movement, conversation, and friendship group is monitored through compulsory phone checks and spying apps on mobile phones. Stepping out of line, a blurred line whose boundaries are ill defined, could lose you your freedom, your children, your family, and even your life itself. With estimates of more than 1 million Uyghurs now languishing in re-education camps, the vast majority of which come from the southernmost districts of Xinjiang, Chen’s people’s war on terror is coming of age. 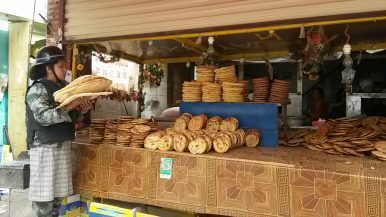 The naan-sellers and small traders still left in Hotan wait in terror for their own time to come. Until then, they continue to don their uniforms, participate vigorously in military drills, attend the weekly flag raising ceremonies, and keep their mouths shut, praying hard that the knock on the door at dead of night is for their neighbor and not themselves.